EA and DICE's Battlefield Hardline made its totally unsurprising debut at E3 2014 during EA's day-one press conference with a whole bunch of gameplay footage and news of a multiplayer beta. The real surprise? That beta is available now, today, June 9 2014 on PS4 and PC. Gamers looking to get right into the Battlefield take on cops-versus-robbers can head to Battlefield.com or navigate to the Battlefield 4 live tile on their PS4 consoles. But the beta is first come, first served, and only running for a limited time, so get on that quick if you want in. 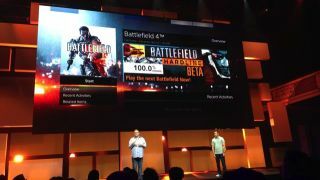 The gameplay footage shown off during EA's presser was the first official footage seen, though the game leaked weeks ago and most fans knew what to expect. But that only detracted minimally from the excitement of seeing Battlefield-style combat between cops and criminals in an urban environment with helicopters, rocket launchers, car chases, and Man of Steel levels of wanton destruction. Battlefield Hardline features 32-player matches, which is not bad at all - just look at this year's big Xbox One hit Titanfall, which only featured six-on-six multiplayer. The new Battlefield game is scheduled for release October 21 2014.